A cast from the past or a casting that will last . Whether you are a minerals extraction company looking for heat and wear resistant liner materials, or a planner or builder looking for an item of nostalgia cast from patterns a century old, the AFFCO foundry can help you. Made from patterns nearly 100 years old, AFFCO manufactures continues to cast several styles of lamp posts. From an earlier era or to today, when our castings are tested against the toughest rock on the continent, we utilize modern techniques in achieving excellence. The foundry utilizes an automated spectrometer to facilitate exacting standards and boasts a fully equipped pattern shop. 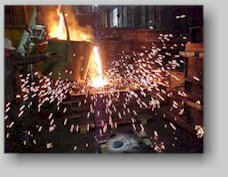 All castings are wheelabrated and we have full heat treating capabilities. The metallurgy of each heat is checked with our spectrometer to verify that each casting meets the required elemental composition. Ultrasonic testing is also performed, when required, to confirm casting integrity. By being the largest recycler of metal in the state of Montana, AFFCO maintains a lower customer pricing structure. By innovating and automating a "least cost charge" system, AFFCO can further reduce costs for the customer. The foundry produces high quality sandcastings from various metals including Ni-hard, chrome-moly, manganese, grey iron, ductile iron, stainless steel, brass, bronze, aluminum and custom metallurgies. 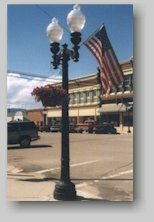 While AFFCO specializes in abrasion resistant and heat resistant industrial castings, continuity in foundry history persists with the manufacture of a variety of historically authentic lampposts, hitching posts and decorative store fronts. The original patterns from the late 1800's and early 1900's continue to be used. The foundry is supported by a fully equipped pattern shop. Castings that require machining can simply be moved further down the building to the AFFCO machine shop.